Dads set the temperature in the home, not moms. You’ve heard it said, “If Momma ain’t happy, ain’t nobody happy! and “If Daddy ain’t happy, nobody cares!” But the truth is dads set the temperature in the home. Dads are the pace-setters. Dads are the initiators. Dads are the leaders. Everything culminates on Dad. We see this in scripture, don’t we? In marriage, it begins with dads (or husbands). Ephesians 5:25 says, “Husbands love your wives, as Christ loved the church and gave himself up for her.” Christ initiated. Christ loved us. Christ served us. Christ gave his life for us. So we husbands follow his example. Yes, wives are called to submit to their husbands, as to the Lord. But a wife who is well-led, loved and cherished will gladly submit to her husband’s lead. It all starts with him. The same holds true in parenting. Ephesians 6:4 says, “Fathers, do not provoke your children to anger, but bring them up in the discipline and instruction of the Lord.” Did you catch that? 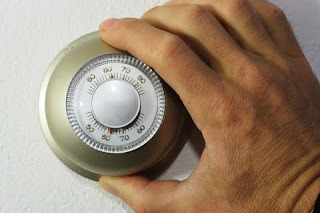 Dads control the emotional temperature in the home. We have been given delegated authority from God to guide our children emotionally, but we can abuse this authority and provoke our kids to anger. We can throw cold water on our kids by over-parenting them, criticizing them, and pushing them to perfection. We end up driving them instead of guiding them and we wonder why there’s so much tension in the home. There is a better, biblical way. The Scripture says we are to be patient shepherds who love our children and bring them up in the discipline and instruction of the Lord. This is our calling. Dads, we set the temperature in the home, mom doesn’t. We take the lead and our family follows. We initiate, they respond. Seems humbling and overwhelming, doesn’t it? Thankfully God knows our frame. He knows we live in a fallen world and it’s not easy. Yet he meets us in our weakness and loves to give grace to the humble. Thank you for putting the leadership responsibility back on the man like the Bible does. So many times the woman is pushed into the leadership in the home because she is taught that she must set the tone in the home. You are also right about the woman following when the man loves her and properly leads her.